ITEM #CF AERO: WATERMAN CF CONVERTORS. 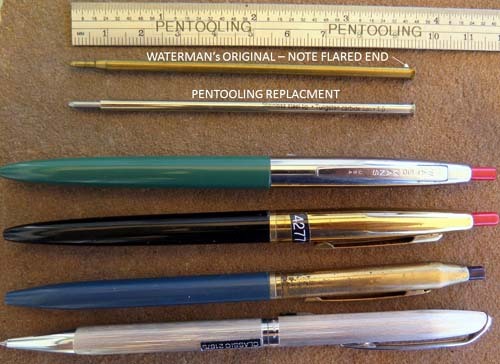 Hard to find convertors that fit the original 50's vintage and the 80's vintage ("CLASSIC") Waterman's CF pens. Section end is .236" dia. (5.99 mm); back end is .260" dia. (6.60 mm), length = 2.377" (60.42mm). There is a rubber conical seal/seat built into the front of the convertor. These are Aerometric, not piston. 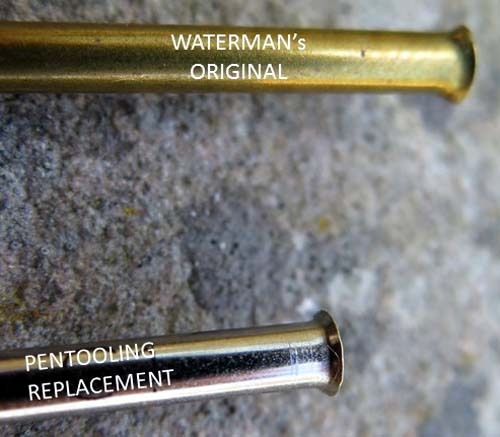 ITEM #MAN100INNERCAP: INNER CAPS FOR WATERMAN LeMAN 100 FOUNTAIN PEN. An exact replacement part for the Man 100 inner cap. 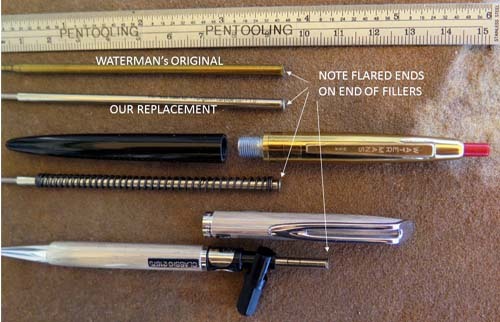 The original frequently breaks, eliminating the ability to get the cap to stay on the pen.Also fits the Opera and other Waterman pens the same size as the Man 100. This cap comes apart using a screw driver removing the screw inside the end of the cap. Mind the flat orientation notch in the top when installing the new inner cap. ITEM #WTMN PSTN CNV: STANDARD SIZED WATERMAN's PISTON CONVERTER. Unused and clear. 2.87" Long, O.D. of insert = .171", I.D. of hole = .089"
ITEM #PHILEAS BLIND CAP: REPLACEMENT BLIND CAPS FOR WATERMAN PHILEAS FOUNTAIN PENS. An exact match in form, fit, function and finish as the originals, which weren't shellaced or glued-on. If you're mising yours, here's your chance to make your Phileas presentable again. Use a dab of shellac this time to make sure it stays with your pen. We also have the gold plated "Cigar Bands" that fit on between the blind cap and Barrel. Blind caps $20 ea, Cigar bands $15 ea. ITEM #PHILEASFRONT: WATERMAN PHILEAS FRONT ENDS IN MEDIUM AND FINE. Includes nib, feed and section. ITEM #PHIL CAPs: PHILEAS CAPS - 6 COLORS AVAILABLE: MARBLED RED, MARBLED BLUE, MARBLED VIOLET (W/ RUST COLORED STREAKS), MARBLED GREEN, BLACK, and PALE BLUE. Specify by letter from the photo. ITEM #PALE PURP PHILEAS CAP: PALE PURPLE PHILEAS CAP. Uncommon color. The clip is there and in excellent condition; it just wasn't shown to allow a better look at more of the color. ITEM #PHIL BBLs: WATERMAN's PHILEAS BARRELS. Two uncommon colors available. Specify top or bottom color. ITEM #GLOBE FRONT: FINE FRONT END FOR A WATERMAN OPERA OR MAN 100. Works, writes, and feels great. Comes with a Waterman piston converter. Two tone nib with globe, which was used on both the Opera and the standard Man 100.